🥂 Get Festive with Holiday Dining & Parties at SOHO! It’s the most wonderful time of the year! We love celebrating the holidays with our guests and friends that we’ve gotten to know for over 21 years now. Whether it’s an intimate group for dinner, or a much larger party, we can accomodate your needs and we offer set menus to make your event easy and enjoyable! The perfect gathering place for after work cocktailing and light snacking..the bar is famous in Vinings for its regulars, old and new, people watching, and engaging bartenders! Come try our extensive and unique wine list and speciality cocktails. You may just stay for dinner! 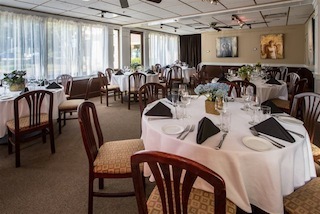 Enclosed by windows overlooking the Vinings Jubilee courtyard, the Sun Porch is an intimate gathering area that accommodates from 14 to 22 guests in a semi-private setting and up to 46 as a private room. The Pace Room is engaging. Accommodating up to 50 seated guests, and 75 in a standing meet and greet, we offer set menus that allow you to control the flow of dinner as well as the cost. Give us a call at 770-801-0069 today to book your holiday party, we still have a few remaining evenings available! We would love to host your event and get festive with you! Whether organizing the office party or an intimate gathering for family and friends, SOHO Atlanta restaurant has rooms to suit your event. Let us handle everything, and all you’ll need to do is send out the invitations and enjoy the party! The Pace Room accommodates up to 50 seated guests, and 75 in a standing meet and greet. Additionally, SOHO offers set menus that allow you to control the flow of dinner as well as the cost. Enclosed by windows overlooking the Vinings Jubilee courtyard, the Sun Porch is an intimate gathering area that accommodates up to 22 guests in a semi-private setting (with privacy curtain) and up to 46 as a private room. Our event menus for lunch can be found here and our event menus for dinner are located here. Menus are customized for each place setting, allowing guests to make personal selections. Vegetarian and gluten-free options available. Please book now to get your choice of room and date. Contact Susan Smith for availability, menus and pricing. Be sure to let us know about any special requests, as it’s our job to make you shine! With the arrival of November – and cold temperatures – it's hard to deny the holidays will be upon us shortly. If you are planning a party this holiday season, we invite you to consider SOHO Atlanta for your group. 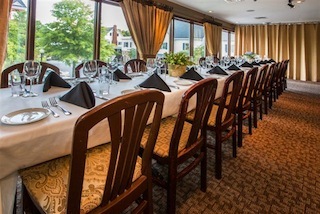 The restaurant offers several private dining options, including our airy Pace Room or charming Sun Porch (overlooking the Vinings Jubilee). For more information about private dining at SOHO, please click here. We will be happy to tailor an event to meet your needs, so please don't hesitate to contact us at 770-801-0069 or info[at]sohoatlanta.com. SOHO is proud to offer a gluten-free menu for our diners. The restaurant's complete gluten-free dinner menu can be found here. Great choices abound on the gluten-free menu. Among the options for appetizer: SOHO's signature chicken soup with tortilla chips, fresh butternut squash soup, and a house-made fresh mozzarella salad. Gluten-free guests may have a hard time choosing an entree from all the enticing options, including a Mayhaw-glazed BBQ Scottish Salmon served with roasted fingerling potatoes and sauteed swiss chard, and an "1855" Beef Tenderloin served with horseradish mash potatoes, asparagus, and a natural reduction. See you soon!